Once upon a time there was a boy in Rostock who felt an urgent need to escape from the crowded downtown at least for an hour. 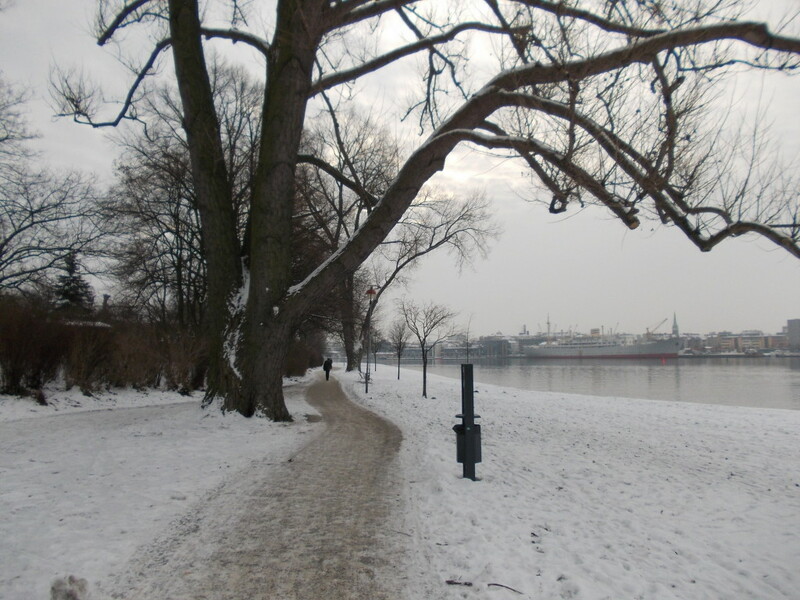 While he was walking along the Warnow River next to “Am Strande“ (the biggest road in the city center), he took a look to the other river bank and dreamed of crossing the calm water. 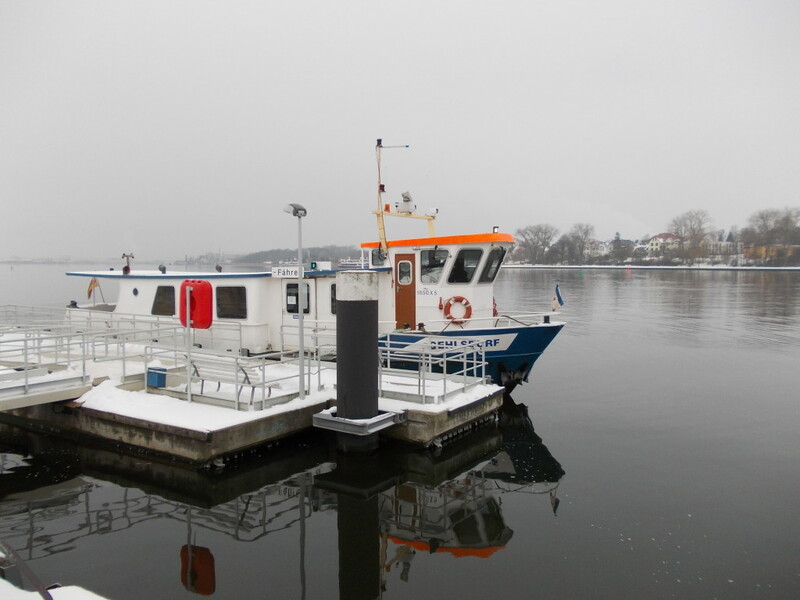 He reached the “Kabutzenhof“ and surprisingly a small ferry lay waiting at the quay. He just had to wait for a little moment because on working days from 6:10AM till 7:45PM it casts off to Gehlsdorf regularly every 20 minutes. From the ferry he could get a beautiful view on the city, its steeples and on the harbored ships . On the other side seemingly rural houses and the trees along the river banks gave an idyllic impression. Hecticness and unease were gone. Beyond the River a snowy path was lying at his feet inviting him to a solitary walk. Along the way some winterly trees were helping to turn town- into landscape. Walking causes hunger. So he felt like eating a snack. Fortunately his backpack was well packed with some fruits, veggies and a small thermos bottle with hot chocolate. Missing convenience stores or cafes left him no other choice anyway and sometimes a bench is a comfortable place to eat and rest too. Looking to Warnow River’s other bank signs of various cafes and restaurants aroused his attention and an idea of trying them next time came to his mind. After walking quite a while the path ended at “Dierkower Damm”. Following that street on the right hand side there was a tram station for line 1,2,3 and 4 (all directed to city center). By taking the next tram and with the sound of the closing doors his recreational ferrytale was over. As a former exchange student in Amsterdam (2007) I always had to seek urgently for nice insider tips that went beyond the usual tourist stuff. 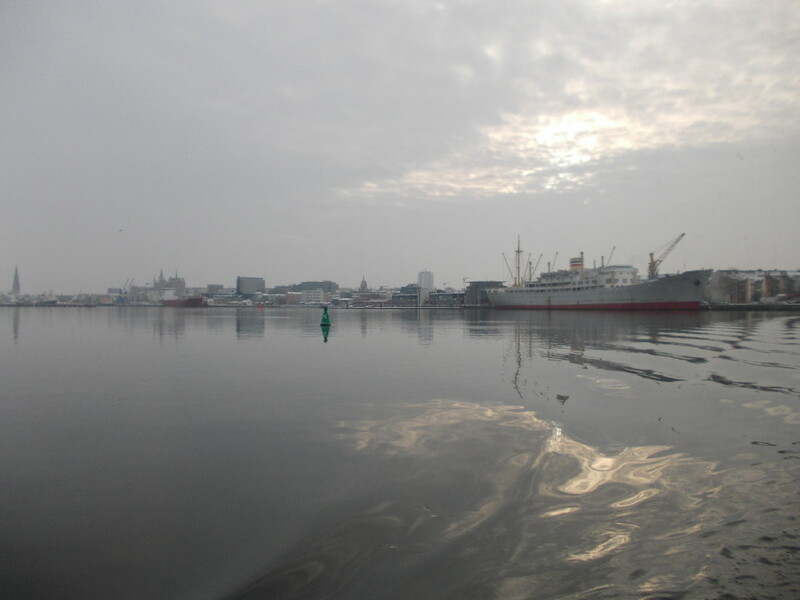 Now I love to share my favorite things to do in Rostock and the region with people that visit this nice place. No matter if it is about cycling, inline skating, eating out cheaply or even busking: there are always some tips I can give you when backpacking in this region. This entry was posted in Rostock & MV, Rostock & Warnemünde and tagged Ferry, Gehlsdorf, Nature, rostock, Walk. Bookmark the permalink.